Thoughts of Easter haven't made me think of compassion in the past. However, this Palm Sunday, I can't stop pondering how compassion is woven through the story of Christ's sacrifice for us. Because of God's compassionate heart toward us (His estranged children), Jesus laid down His life to restore the bridge between heaven and earth. A decision made long before sin became an option. Compassion paved the way at creation when we were being lovingly crafted by hand. It flowed through history as time and time again, the people of God found themselves enslaved and scattered. And though it did not end here, compassion boldly held to the cross as our Savior selflessly became the substitute for what we deserved. Compassion rolled away a stone that could not be moved in human strength and called to life the ultimate Example. It was Compassion that walked the road to Emmaus and showed Himself to the disciples to ease their minds and fulfill the foretold prophecies before their eyes. In compassion He stands on the right hand of the Father, and awaits the moment He can receive us again. I am moved to tears because of this Godly compassion and how I am still a recipient of its activity from past events, current blessings, and future hope. Life is not the same when compassion is at the helm, guiding your thoughts and behavior. As this week brings solemn, yet joyful reflections let us put on compassion. 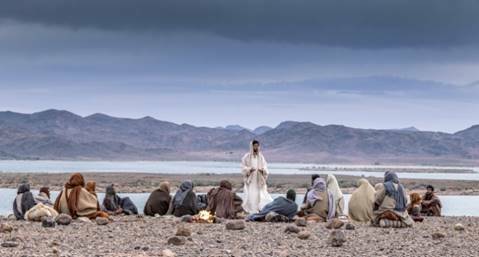 With that said, the final episode and finale of Jesus: His Life airs tomorrow, April 15th on the History Channel. This series finale will explore the special bond between Jesus and Peter, and features Jesus’ loving and unforgettable words, “Feed My Lambs” and ‘Take Care Of my Sheep.” I hope you will consider watching as a part of your Holy Week activities. I'd love to hear what you think below.